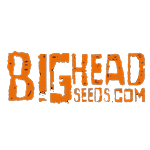 We are proud to announce the welcome arrival of Big Head Seeds. In 1990 after a life altering experience one of the Big Head founders set off around the globe with a mission to discover ceremonial plants and the people who understood their individual properties. 12 years later (2002) he facilitated a meeting at Burning Man between two expert plant breeders, one reclusive Californian genius and flying Dutchman (literally). The result: an eclectic and passionate crew of experienced geniuses that know marijuana better than you know yourself.